Today’s rock review highlights the brilliantly blue Lapis Lazuli. Sometimes abbreviated to just Lapis (the word for stone in Latin), this semiprecious gem is known for its vibrant cobalt color that can contain marbling of yellow and cream tones as well as tiny flecks of gold. This rich spectrum comes from a combination of sodalite (blue), calcite (white) and pyrite (gold). It has a chalky luster, but still is able to take a high polish that enhances it’s lovely composition and makes it a prime choice for jewelry featuring a cabochon. Lapis Lazuli was a very popular gem amongst ancient civilizations like the Egyptians, Mesopotamians, Greeks and Romans. The gem can be found in jewelry, large scale tile mosaics and in church art. One of the most famous examples of Lapis Lazuli used in church art is the at the tabernacle designed by Gian Lorenzo Bernini for the famous St. Peter’s Basilica in Rome. The edifice of the gilded bronze structure is encrusted with Lapis, the perfect contrast for the gold surface of the architecture. Cleopatra was even reported to use the powdered form of the stone for eyeshadow. While we don’t use Lapis as a cosmetic these days, it still is sometimes used in its ground form to give pigmentation to tempera and oil paints. Most modern people prefer to enjoy their Lapis Lazuli in the form of jewelry. It is thought to grant its wearers insight, wisdom and enhanced intellect. The gem is very easily maintained at home and can be cleaned with a warm water and soap solution and a soft toothbrush when necessary. Below is a great example of Lapis Lazuli by Layne Designs. Contact Layne for information regarding availability. In today’s rock review will take a look at an “international gem of mystery”, the Dendritic Opal. It is found across the globe, and colors range in many neutral tones, from tans to grays often mottled with white. Part of what makes Dendritic Opal so beautiful is its dark branching formations called dendrites. They appear to be similar to moss or roots giving it a unique look that many people think is reminiscent of a fossil! However, the dendrite branches actually come from the mineral Manganese rather than fossilized plant life. Luckily for Opal lovers, it is easy to maintain the gem at home since it can be cleaned with a simple dish soap and warm water solution then thoroughly dried with a soft cloth. Many people have long enjoyed Dendritic Opal for its metaphysical properties of promoting spiritual growth. It also is a popular gem with healers, aiding in treatment of blood, breathing and skin disorders. The famous Carl Faberge (think Feberge Egg) was a fan of Dendritic Opal and used it in a number of his pieces, some of which were supplied to the Russian imperial court. Many gem lovers in the 21st century are still enjoying Dendritic Opal for its unique marriage of rocky and organic looks. Some confusion surrounds the stone’s identity and make up due to some aliases sometimes given to doppelgangers of this gem. 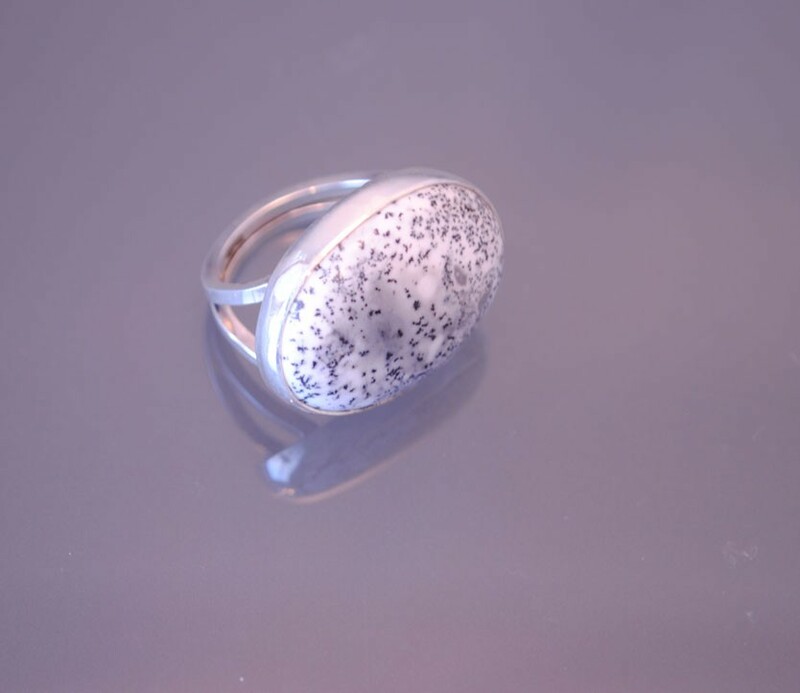 For instance Dendritic Opal is often referred to as Merlinite which is actually a Chalcedony. Merlinite was dubbed an “Opal” because of its opalescence, but is not in fact an Opal. Agates with dendritic features are also sometimes labeled Dendritic Opal, but also are not authentic Opals. A true Dendritic Opal IS a common Opal, meaning it has no play of color, that also has the presence of dendrite formations. Check out this lovely piece from Layne Designs in Dendritic Opal! A jeweler who does custom work has the joy of sharing many of life’s important moments with their customers. Human beings across cultures recognize the symbolic significance of jewelry. It’s used to celebrate, to mourn, to commemorate and to convey a message. This was something that I, of course, logically knew prior to my time as an apprentice, but now that I am working first hand on these significant pieces, the true meaning of this has really begun to sink in. Not too long ago, I assisted Layne in preparing memorial bracelets for a family that had lost a loved one. As I cut the metal to length, I thought about the people, their loss and their desire to remember their family member. I prayed silently over the pieces asking that God would make them a tangible source of comfort for their wearers. We recently also had the privilege of working on the wedding band of a friend. I felt so privileged to share in their joy as I watched Layne create the ring and thought about the union that it symbolized. We live in a mechanized world. Because of this, modern humans are so rarely are able to engage in a physical interpretation of lofty concepts, such as love or grief. There is something truly significant creating these pieces by hand. 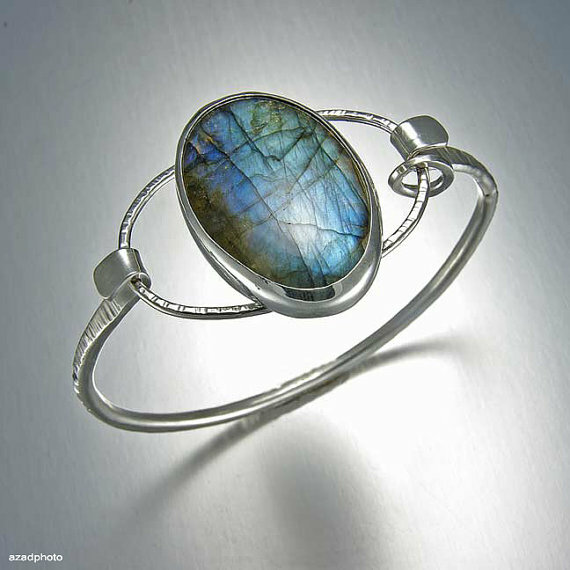 As, I work with the metal and stone, my hand moves in empathy and compassion. As I develop a design, my mind is fixed on the story of the people and the ideas my work symbolizes. As I give a final polishing, my imagination is captured thinking of all the memories and moments the piece represents and will come to represent in the future. These are things that a machine can’t do. I believe that all the best wishes and love that I feel are embodied in the work I do, giving pieces that much more meaning to their wearers. Being on the artist side of the process has taught me that life’s significant moments are even more remarkable when they are brought to life in tangible form. It truly is an honor to be entrusted with these precious symbols. Today’s gem, Smokey Quartz, gained a some popularity over the past year as it has been used to compliment the many grays and neutral tones we are finding in our closets these days. Smokey Quartz, as all Quartz, is a silicon dioxide crystal that forms over time as oxygen and silica based solutions that are present in the earth combine together. The dark gray/brown tones in Smokey Quartz are a result of “free silicon” by product of the chemical reaction that then colors the stone through irradiation. Quartz is the second most prevalent mineral (Feldspar is first) in the world and is found in many sedimentary, igneous and metamorphic rocks. It can be found in widely known stones such as Granite, Rhyolite, Obsidian, and Sandstone. Some special varieties of Smokey Quartz are Morion and Cairngorm. Morion is the name for a color of Smokey Quartz that has a rich, even, glassy black appearance. Cairngorm is found in the Cairngorm mountains of Scotland and has a smokey yellow/brown or gray/brown color and is a popular trademark of traditional Scottish jewelry. Many people prize quartz as mystical stone that possesses healing powers. Smokey Quartz in particular is believed to be useful in healing ailments of the abdomen, kidneys, pancreas, hips and legs. It also is useful for pain relief, particularly for headaches, muscle aches and nerve pain. Many varieties of quartz are also used to bring clarity to dreams, secure a peaceful sleep and instill a sense of well being. Check out a recently made Cocktail ring from Layne Designs in Smokey Quartz. Contact Layne for more details on this beauty or a few of it's "friends" in other quartz varieties! The lovely warm weather has everyone thinking about the beach. So it’s the perfect time to review Red Coral which is one of the loveliest and most treasured gems from our oceans. Coral is a biogenic gem, meaning it’s developed through a biological process. Some other familiar biogenic gemstones are Pearls, Amber and Ivory. Red Coral is a unique living creature, part polyp and part skeleton, that grows slowly over many years as a result of calcium carbonate deposited by marine invertebrates after they die. Carotenoid pigments account for its beautiful red to pink color. Coral has been used as jewelry and decoration for many centuries not only for its vibrant color but also because of cultural beliefs in its magical and medicinal qualities. Greek, Roman, Native American and even a few ancient barbarian tribes, such as the Gauls used the gem for protection, healing and ceremonial rituals. The Romans used it on pendants worn by children as talisman to ward off sickness and other dangers. Coral can often still be seen in Native American and southwest jewelry design, often paired with Turquoise, ever since the Spanish introduced the material to native peoples in the eighteenth century through trade. The ethical use of Coral has been a hot topic in recent years. Because of its “slow grow” process, harvesting Coral from the oceans in unregulated quantities has become unsustainable because the Coral cannot grow quickly enough to meet human demand for it. This leaves jewelers and jewelry lovers with a dilemma. Is it ok to use and wear Coral? How can this be done in an ethical way? Layne Designs believes that it is important to be good stewards of our natural resources and only uses ethically traded materials in all of our work. In the case of coral, this means that we use vintage coral harvested prior to 1970 in our jewelry. Reusing existing resources through repurposing is a clever and creative way to enjoy the beauty of Coral without endangering its future. Check out one of Layne’s showpiece necklaces in Red Coral below. June ushers in the official start of summer. June 21st, to be precise! Is your wardrobe ready for your summer calendar, which is no doubt already filled with plans of weddings, barbeques, beach trips and weekends away? One of the trends that we at Layne Designs are loving is the “big jewelry” look. This season, think bigger, bolder and more of it. Photos from runway shows and catalogs alike are pairing fabulous bright colors and tribal prints with complementary statement jewelry. You’ll see flashy pendants, large cocktail rings and thick bangles just about everywhere. Wearing multiple items of jewelry at once is also another feature of the big jewelry trend. So, don’t limit your outfit to one necklace or bracelet. Experiment with coordinating two to five of each item to find a cohesive yet daring look that will bring a new and interesting facet to your style. This a great way to add new additions to you accessory collection while still enjoying your old favorites. In accordance with the laid back spirit of summer, you also can leave the pressure to match accessories to clothing behind with the winter months. The word to capture the mood of the season is “effortless”. Mixing metals and contrasting colors are perfectly in vogue this season. So when it comes to your jewelry box, simply go where your heart guides you and enjoy wearing any and all of the things you love. What a breath of fresh air! Layne Designs has many pieces currently available to help you bring your summer look to life. One particular item to turn your attention to is the Brandy Bracelet, which features a focal stone that can be worn as a pendant as well! After all, ladies need to keep their options open in the summer time. 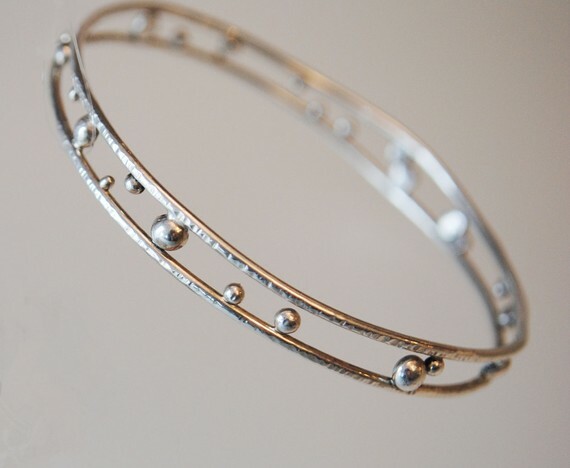 Consider pairing the brandy bracelet with a few of Layne’s Starry Night Bangles for a completed look.